You can search the internet for days and look for the definition of MS. Trust me, I’ve been there! 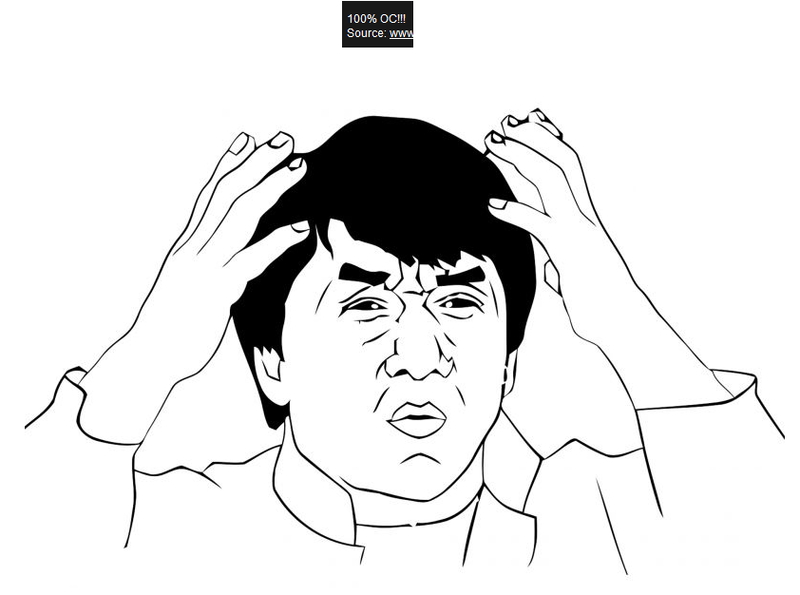 Looking at so many different explanations it only confused me more. So, let me try to dumb it down for those of us who are not studying medicine! Want to know the worst part? Our own immune system is the thing causing all of the damage to our nerves in the brain and spinal cord! 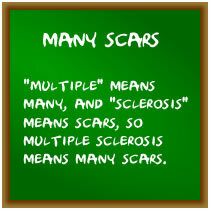 As a result of this, Multiple Sclerosis is known and assumed to be an autoimmune disease. Are you still with me? You can do it, keep going! Now, an autoimmune disease is basically where your body’s immune system (which is usually our protector) targets and destroys foreign substances in your body (like bacteria and such). For those of us lucky enough to have MS (yeah..), this so-called “protector” makes a silly mistake and attacks our good/normal tissue in the brain and spinal cord. Now, remember how I was talking about the symptoms above? This next part will explain how people get these weird symptoms. So, let’s talk about the central nervous system (CNS), shall we? This is made up of nerves, these nerves act like the systems messengers. For example, your brain tells your hand to grasp the handle of your cup of tea, so, you do just that. These nerves are surrounded by a type of fatty substance called myelin. This little stuff helps to protect said nerves and helps deliver the various messages to parts of our body. From A to B; the brain to parts of the body. 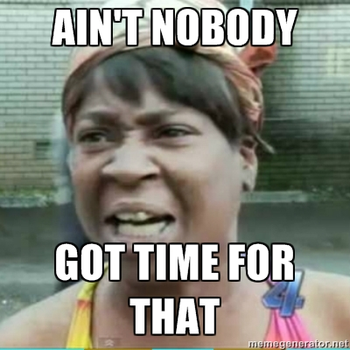 Like text messages or emails! These little messages control muscle movements like walking, talking etc. 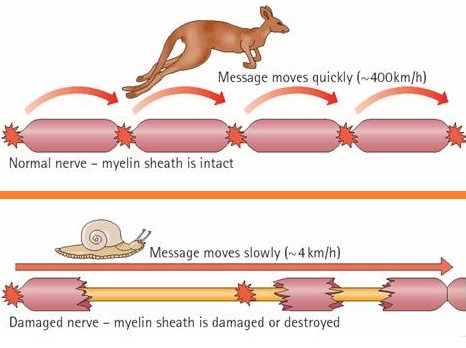 Because of this, the myelin breaks down and/or becomes scarred. This distorts or even blocks the flow of messages, which results in the many symptoms of MS. Sounds fun, aye? Many people explain MS like a faulty electrical flex on a kettle, or like a faulty wire. The nerve can be compared to an electrical cable; the axon, or nerve fibre that transmits the nerve impulse or message, is like the copper wire; and the myelin sheath is like the insulation around the wire. If the insulating flex breaks, it exposes the wires underneath making them more vulnerable to damage. I hope that I helped shed some light on the way Multiple Sclerosis works on the human body! congrats on taking this step .Do you think it would be helpful if you explain your own introduction to MS. ? As in, how I was diagnosed and such? I plan on making posts about the beginning of my symptoms (June 2012) right up until the present day. Is that what you mean? Hi Karolyn, great blog. 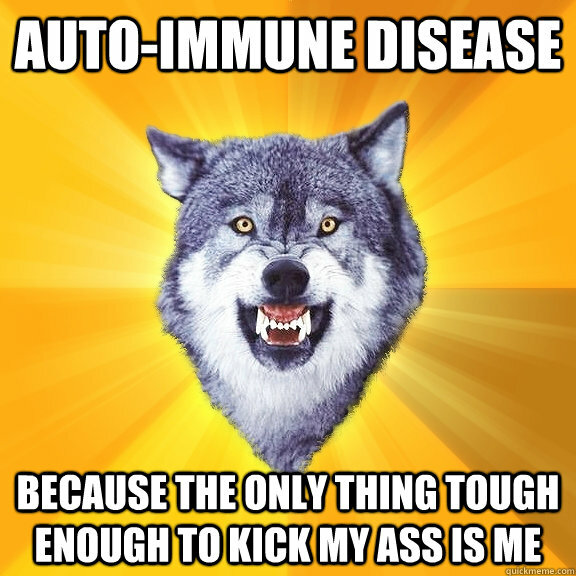 I got diagnosed with MS 3 months ago. I am unfortunately in Australia so it has been a huge thing to deal with. Thankfully I have a super bf who has been my rock but its very hard not to think about what may happen and what impact it will have on our lives. Most days it doesnt even cross my mind that I actually have it. I am starting treatment next month here in Perth. Thanks for sharing your experience so far hope to read more and feel less like Me vs MS.